We currently have thousands of registered candidates looking for work, that's great news if you're looking for employees, franchisees or people to join your business as self employed. If you have a flexible full time, part time or work from home opportunity, direct selling, franchise or other self-employed vacancy you can include all the details in your advert. What's unique about our advertising? A 'Mum's View' is included on all of our adverts - this is a mums view of the job which adds a unique perspective to potential candidates. Include your video - If you have a video that you think tells job hunters exactly what they need to know about your vacancy you can upload that too. SEO and social media expertise - we have a digital and social media expert who'll run an eye over your advert to make sure it's optimised for google then promote your vacancy across all social media channels. Dedicated Account Manager - to ensure you get the best out of your advertising to attract the most suitable candidates. We're not just about job listings - If you'd like to advertise a training course, working parents' support, career coaches, business service or a flexible family run business please get in touch here we'll guide you through the process. UPDATES TO OUR THOUSANDS OF FOLLOWERS: Adverts are posted, completely free of charge as part of your campaign, that's 43,000 Twitter followers, 9,700 Facebook Fans, 1200 Pinterest followers, 1300 instagram followers. So your opportunity will be promoted to over tell over 55,000 people about your business, franchise, vacancy, or training course through social media alone. WEEKLY EMAIL UPDATES: Our visitors don't even need to come to the website to find you. Each week we email our subscribers with all of the new job opportunities listed with us, making it much EASIER TO FIND YOU! With hints and tips on recruiting, advertising, and social media, plus much more to help you grow your business. 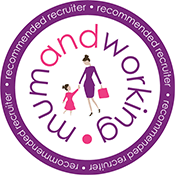 You'll become a member of our FREE Recruiters Zone from the minute you advertise with us and you'll also be given our 'recommended recruiter' badge which you can use on your website to show parents that you offer flexible working opportunities. See our Recruiters Zone here. Please do email us here if you'd like to be included in any of these. Listings start from £24 , you can post your advert by clicking here . Bespoke advertising can also be arranged to suit your business needs, banners, newsletter advertising or even a guest blog post. Just contact us or call 0121 288 0009 and we will be very pleased to help.